The Crusades were a series of wars during the Middle Ages where the Christians of Europe tried to retake control of Jerusalem and the Holy Land from the Muslims. Why did they want to control Jerusalem? Jerusalem was important to a number of religions during the Middle Ages. It was important to Jewish people as it was the site of the original temple to God built by King Solomon. It was important to the Muslims because it was where they believe Muhammad ascended to heaven. It was important to Christians as it is where Christ was crucified and rose again. The Crusades were between the armies of Europe, mostly the Holy Roman Empire, and the Arabs that had control of Jerusalem. In the first Crusade Europe battled the Seljuk Turks. There were around 30,000 soldiers from Europe in the first Crusade, they were made up of Knights, peasants, and other commoners. Some saw the army as a way to get rich and try out their fighting skills, while others saw it as a way into heaven. The initial Crusade began when the Seljuk Turks took control of the Holy Land. Prior to this, the Arabs had been in control of the land. However, the Arabs had allowed Christians to pilgrimage and visit the city of Jerusalem. In 1070, when the Turks took control, they began to refuse Christian pilgrims into the area. Byzantine Emperor Alexius I called for help from the Pope with defending his empire from the Turks and to help push them out of the Holy Land. The Pope helped to gather an army, primarily with the help of the Franks and the Holy Roman Empire. The First Crusade (1095-1099): The First Crusade was the most successful. Armies from Europe drove out the Turks and took control of Jerusalem. The Second Crusade (1147-1149): In 1146 the city of Edessa was conquered by the Turks. The entire population was killed or sold into slavery. Then a second Crusade was launched, but was unsuccessful. 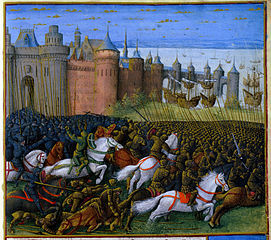 The Third Crusade (1187-1192): In 1187 Saladin, the sultan of Egypt, recaptured the city of Jerusalem from the Christians. A third Crusade was launched led by Emperor Barbarossa of Germany, King Philip Augustus of France, and King Richard the Lionheart of England. Richard the Lionheart fought Saladin for several years. In the end he could not conquer Jerusalem, but he did win the right for pilgrims to visit the holy city once again. The Fourth Crusade (1202-1204): The Fourth Crusade was formed by Pope Innocent III with the hope of taking back the Holy Land. However, the Crusaders got sidetracked and greedy and ended up conquering and plundering Constantinople instead. Children's Crusade (1212): Started by a French child named Stephen of Cloyes and a German kid named Nicholas, tens of thousands of children gathered to march to the Holy Land. This ended in total disaster. None of the children made it to the Holy Land and many were never seen again. They were likely sold into slavery. Crusades Five through Nine (1217 - 1272): Over the next several years there would be 5 more Crusades. None of them would be very successful in terms of gaining control of the Holy Land. "Deus vult! ", meaning "God wills it" was the battle cry of the Crusaders. It came from a speech the Pope gave while gathering support for the First Crusade. The symbol of the Crusaders was a red cross. Soldiers wore it on their clothing and armor. It was also used on flags and banners. Between the second and the third Crusades, the Teutonic Knights and the Templars were formed to help defend Christendom. These were famous groups of Holy Knights.